I met Joan in a course I was taking. One day she happened to bring her journal to class which was filled with quotes, drawings, and collage as well as writing and notes. Several of us were interested enough that she agreed to do a short workshop for us before the class started one day. In the workshop we learned how to make a simple book and how to work with special papers and decorative elements. I loved it and asked her to talk to me more about this type of work, Art Journaling. For many of us, making a commitment to journal is the hardest part. 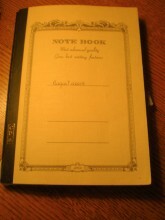 I know I have an assortment of journals that I would write in for awhile and then abandon for long periods of time. How did you move from not journaling to art journaling on a regular basis? Here’s a quote from my journal that I went back and underlined. I added the comment, “And I know I can do that stuff”. That gave me some direction and permission to work in different ways and the insight that collecting and gathering things was as valuable as the actual assembly or writing. I understood that these were things I was capable of doing that could lead me to where I wanted to go with the art journaling. In fact I had been doing it for years, collecting images and quotes, etc. Even to write one has to be an observer, a collector and gatherer of impressions. A bit of breathing space between entries is often necessary. So I moved forward from writing to art with writing by not loosing heart and giving up too soon, and by contributing to the journal in a different way when I wasn’t actually writing. This kept me moving forward. As I look at the evolution of your journal I see that you began adding stickers, highlighting some text in color, adding pieces of other paper that you’ve printed on, and pictures of collages or work that others have done where you had a response. I began in earnest to decorate the pages by gluing favorite papers and clippings and found that on some days I was more inclined to be visually creative and not write at all. As it turned out it became part of my process, the way it worked for me. It’s often difficult to find time to do both art and writing in the same sitting so allowing several days for the preparation of arty backgrounds is great fun. Then the journal’s good to go for the times you just want to write. Can you talk a bit more about the transition from “words with art” to “art with words”? Sure, there is a really obvious turning point in my first journal, on the page and in my mind. It occurs on the fourteenth entry. I had been leaving blank spaces so I could go back and add something to the page, and realized that I didn’t enjoy working on blank white pages at all. For a lot of people the blank page is intimidating, it almost questions your ability to place anything significant on it. So I realized that by adding color or an image it instantly became more inviting and accepting to words. During a trip to Calgary in 2004 I had picked up a copy of the September/October issue of City Palate, a locally produced free publication dedicated to the Calgary food scene; the cover was a beautiful fall pastel painting with the caption “digging up the harvest” (in hindsight a perfect synchronistic phrase for the journey I was embarking on). I covered my whole journal page with it and wrote over the top of it. I’d never read anything specifically about art journaling, hadn’t even known such a thing existed but right away the application of color made a huge impact. After that page the images and color become dominant, and I begin to write in the spaces provided by the composition. Up until this time I felt that I’d been dabbling, but after that I felt committed. No more shy little pieces of paper or drawings scattered here and there. I committed to the whole page. In the journal I comment, “I want something more adventurous, more spirited, more lively.” And of course, I am not just talking about the journal. For the first time I saw myself as creating the art as opposed to pasting it in. I can see that in the beginning you are mostly writing, and then it changes, and it almost seems that what you are reflecting on changes as you add more images. Are you working with a process? Actually, the process was working me. In the beginning I was really trying to find a form, some kind of venue for expression and that naturally evolves over time and with continued effort. You might refer to the extras that I started including on the pages as ‘visual aids’ for they guide you often into writing about something you may not have planned for that day. These entries become the happy and revealing accidents. For example a photograph of autumn leaves may inspire a memory of a childhood Thanksgiving or the photo of a recently read book jacket recalls something to mind that the author wrote that resonated with you. Even placing a quote in a ready-made box created by your use of attached images can be a jumping off point for your writing. By writing and doing ‘art’ in this manner I committed to the journal process, whether I realized it or not. Another thing I did that I’ve carried forward is this; I usually read at night, and then anything that strikes me from my reading, I’ll journal about the following morning. I’ll record a sentence or a paragraph and then comment on why that has meaning for me at this time in my life, maybe explain something similar that I’ve experienced recently. Then I’ll surprise even myself because a thought I’ve never had suddenly occurs to me. So I write about that too! Are you able to become more conscious of patterns that may have been unconscious when you first journal them? Exactly. These entries start weaving into the fabric of who you are, what matters to you and why, what nurtures you and gives your life substance and meaning. You are mapping your life, giving yourself a means to connect the dots over time and look at the bigger picture of your journey. Who are you writing to? Does it sometimes feel as though you are writing to a future self, or offering comfort to a past self? You are writing to your soul; having a soul conversation. It does sometimes feel as if there are lost pieces of yourself that you recover, that you can see your past actions in a new and more gentle light. Also, you are writing down your aspirations, your hopes and dreams, as well as your doubts and fears. Sometimes you don’t know what you want until you write it down, or more likely, what you don’t want. You are writing your way into your life. The entries become like a snapshot of a particular time. When you go back to your journals, it helps you to see who you’ve become. It becomes another way of acknowledging yourself and honoring your ‘work’. An interesting exercise would be to pretend you are a stranger finding a journal (yours) and reading about your life. What do you notice most about this person? What questions would you like to ask her/him? Or pretend you are that future self and looking back from the vantage point of years of well-earned wisdom. What kind of conversation might you have with your younger self? When you journal, you journal alone, even though there may be someone else in the room. Your interaction is with your experience, and with the materials you’ve gathered. What happens when you talk to someone, as we’re doing now, about this private experience? It’s the concept of the third person. When two people talk, there’s a third presence that’s added to the conversation, and an awareness that’s different. There are possibilities that open up in dialogue, whether you are dialoging with your own experience on the page, or in dialogue with another about journaling. An interesting sidebar here is that the administrative headquarters for Ira Progoff’s materials on the Intensive Journal Process is called Dialogue House. Journaling is the excavation of yourself and your experience. It’s a bit of a paradox because as you put down different layers of experience you also have the chance of exploring what’s underneath them. The journal can be a place to explore and experiment, and as I look back I can see that’s what I have been doing. In terms of privacy it is important to begin journaling with the understanding that it is always your choice to share what you’ve written or not. After all, these are your words, your thoughts, your experience. If you find yourself writing with a view to sharing what you write in your journal, then the authenticity of the writing you are doing for your soul may be compromised; how you write changes with the audience, just as how you speak changes with the audience. This doesn’t mean you’ll never choose to let others see your journals. Usually after a certain period of time has lapsed, and you have grown you’ll become less attached to what you wrote three or six or so years ago. If you can approach your journal without expectation, without demanding you produce the Book of Kells or worrying about the profundity of your thoughts, it will go better. The benefits come from a longer process. It’s about keeping going and being open to the unexpected. This unexpected quality is one of the true gifts of journaling. You find yourself writing something you never thought you knew. Again, you are uncovering new information, new sources for yourself. It’s as if something comes toward you as you are writing, is drawn to you by your writing. When you are in transition, writing down what you want to move toward can help set the stage for developments in the future. It can also inspire synchronistic support. You mentioned that because we were going to have this conversation you looked back over your early journals. What’s that been like? It’s been very encouraging. I go back to those journals and see the underlying need to find purpose and make sense of things in my world; I also see the uncertainty and doubts. Some of the questions and the concerns are similar to what I currently write about and I have moments where I wonder if anything has changed at all over the years. Yet it has. I am standing in a different place now. I see that person as someone who was just beginning to make a conscious choice to acknowledge an inner life as being instrumental in having an effective outer life. She was someone who didn’t yet grasp the power of keeping a journal as a form of guidance but was aware enough to want to commit to documenting her unfolding life. All lives unfold but unless you have an exceptional memory and can relive past feelings accurately, it’s difficult to pinpoint growth unless it is written somewhere. It’s like reading a letter you wrote from long ago and a memory you thought you’d lost is found. But you needed the letter to trigger the memory. Journal writing is such a trigger. They are the letters you write to yourself. I can also see that I’ve become more compassionate toward myself and less attached to “the struggle” knowing that things change and life is moving you forward despite your best efforts to stay ‘stuck’. Those ‘stuck’ places I thought I was in were simply stepping stones and as beneficial as the so called unstuck places. I could liken it to the collecting of papers and images, they may not be producing something tangible as in a finished art piece, but as I said earlier, they are just as valuable. I’ve learned to place more worth on the “being” of who I am rather than only on the “doing”. I met Joan in a course I was taking. One day she happened to bring her journal, which was filled with quotes, drawings, and collage as well as writing and notes. Several of us were interested enough that she agreed to do a short workshop for us before the class started one day. In the workshop we learned how to make a simple book and how to work with special papers and decorative elements. I loved it and asked her to talk to me more about this type of work, Art Journaling. What’s the difference between the dear diary-style we learned as kids, which was all words, and art journaling? You could look at it as art with writing or writing with art. Some people are more word oriented and start off writing and then add art, and others start off with painting, photographs or art and then add words. Another way of describing the different types of journaling methods could be writing- focused or art-focused. The old adage of a picture is worth a thousand words holds true because the images, drawings or collage that you add to your journal also say something about who you are. In fact the images you choose link you to your intuitive and unconscious self maybe more so than the words you write. The art- focused journal relies on the images to tell the story, but there are no hard and fast rules. It’s good to start without an idea one way or the other. Just begin with whatever focus you are comfortable with and let the process take you. The fewer guidelines you have the more likely you’ll be to enjoy journaling and continue with it. What if you don’t consider yourself an artist? You don’t need to be a trained artist to be creative, just like you don’t need to have a Masters in English Literature to keep a journal. Besides, we are all creative beings. Like Rumi says, “Inside you there’s an artist you don’t know about”. What’s needed, as in all endeavors you have an interest in, is not how you do it, whether it be writing or art, but that you do it. Also, I use the word ‘art’ very loosely. If you can use scissors and glue and crayons you can create an art journal! Shelve the inner critic. Like any young girl I started with a diary at about eight or nine years old, but even before diaries I think we wrote in autograph books. When I was about twelve and going through adolescent angst I started writing poetry, but the actual journal work that I do now didn’t begin until 2001 after buying Julia Cameron’s book, The Artist’s Way. I started doing morning pages, as she suggests in the book, and did the stream of consciousness kind of writing for several years. I found that I did a lot of complaining, not that there’s anything wrong with that, obviously I felt the need to express myself in that manner and much has been written about why that style of writing is helpful, but the bottom line is that it got me writing daily (for the most part). I graduated from individual pages to the ‘book’ format in August 2004 when I made a conscious decision to keep a journal. The intention for the book came from The Purpose of Your Life, An Experiential Guide by Carol Adrienne where she suggests that you jot down anything that you overhear, think about, read or see that catches your attention more than usual that day; things that excite, delight, or encourage you or a brief description of someone you admire and why. My goal was to write in the morning and again at the end of the day for a month. Manageable, I thought, but soon enough realized I had been a tad overzealous and guilt became my companion as days would go by with no entries. So I relaxed the criteria. This was the first creative thing I had committed to in a long time. The best news was that I persevered. How did you choose your first journal? When you start it’s important to pick something for your journal that’s pleasing to you. Your words are a gift to yourself and you want to wrap them in something special. What drew me to my first journal were the black and cream graphics, the quality of the paper, and the cover, which encouragingly says, “Notebook – Most advanced quality Gives best writing features”. It reminded me of the scribblers that were handed out at the beginning of each new subject in elementary school. They too were cream and they had a maple leaf on the cover, the times table was on the back. The pages were smooth, they smelled of fresh ink. It was a real sensory experience and there was anticipation and excitement about what I would be learning. This time though the subject would be me. I wanted to treat my writing seriously; I wanted to treat my thoughts with respect. I have kept a journal in books of assorted sizes and shapes since that time. I still struggle with creativity, but I can look back and see how I’ve progressed and grown, both in my writing and how I choose to embellish the pages. The art journal has become an integral part of my journey through this life and a necessary vehicle for self expression. I’d like to end this segment with a quote from Virginia Woolf, who in her lifetime filled approximately thirty-two notebooks. Next time: From words with art to art with words.